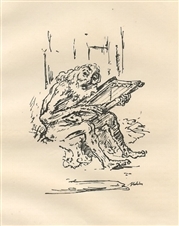 Alfred Kubin original lithograph "Jeremiah"
Medium: original lithograph. Printed in Germany in 1921 for the rare Ganymed portfolio of "Das dritte Jahrbuch der Marees Gesellschaft", published in Munich by Marees-Gesellschaft, R. Piper & Co. The lithograph was printed by Franz Hanfstaengl, of Munich. This impression is from the unsigned edition of 950 printed on laid paper (the total edition was 1150, of which 200 were signed). The image measures 5 x 3 3/4 inches (130 x 90 mm); with full original margins. Not signed. Condition: there is foxing and staining to the margins (see the second photo).